If you were to ask Teresa Begay three years ago if she would ever run in a 5K, you probably would have heard a colorful version of “No way!” from this fiery woman. However, just three years after a devastating diagnosis and recovery of Guillain-Barré syndrome (GBS), Begay is doing just that. GBS is a rare neurological disorder in which the body's immune system mistakenly attacks part of its peripheral nervous system. She plans to complete her first-ever 5K in the DC Wonder Woman Run series in late March. Begay’s journey with GBS started in mid-February of 2015. What began as half of her body going numb, was followed by three different hospitals dismissing her symptoms as a mental breakdown and prescribing her numerous psychiatric medications. Finally, after 46 days, Teresa was diagnosed. However, by then, the damage was done and was severe. “Most people are diagnosed within a few hours to a few weeks. Not over a month,” she said. It had been over a month and Begay’s nervous system had taken a serious hit. She was unable to sit up, hold anything, roll over or stand. She was constantly in pain but numb at the same time. It took months of doctors visits for Begay to find her neurologist and recovery team. What helped her most through recovery was her family. “My family has been with me every step of the way. I think the people at the Sports & Fitness Center know their names better than mine,” she said with a grin. She was excited that her family would be joining her to complete the 5K. For three years, Begay went through physical therapy, aquatic therapy and started to exercise at the Ability360 Sports & Fitness Center. Begay says working out came naturally. During her rehabilitation, she began working in the Project Independence and Empowerment program (PIE). The program is for people who have gone through rehabilitation at St. Joseph’s Hospital and Medical Center or any other Barrow program. She was introduced to the Sports & Fitness Center through this, and as soon as she entered, she fell in love. Now, she is there four times a week. Begay’s goal is to complete the 5K under the hour and a half time limit, using her walker and wheelchair. She will have her team by her side the whole way. “The most difficult part was feeling defeated and losing my independence,” she said. But with patience, self-love and teamwork, she says anyone can meet their goals. When asked what words of advice she would give to someone starting their journey to recovery she said “Relearn the new you. Make friends who are going through the same ordeals. Be ok with slightly letting go of your independence,” Begay said. Once she’s completed the race, Begay’s next goal is to try the rock-climbing wall at the Sports & Fitness Center. “I used to climb in college and would love to do it again.” She knows with the support of her family and team, she will be able to work toward any goal she sets her mind to. Editor’s Note: Teresa finished her 5K race in 1 hour and 29 minutes. Kelly Beaubien has been a member of the Ability360 family for over five years as a caregiver. 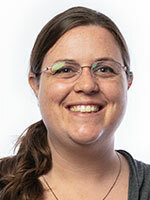 Kelly has a bachelors in education from Arizona State University and teaches English to ESL students. She is the mother of two boys and wife to Ability360 graphic designer, John Beaubien. In her free time, she enjoys crafting and the occasional live 5K or virtual race. Read more by Kelly Beaubien.